Cracks are unfortunately a common but preventable occurrence in most concrete surfaces. The vast majority of cracks are due to the lack of planning for expansion joints when the concrete is initially installed. A qualified concrete contractor should have a plan in place before any concrete is poured to control any possible cracking issues with expansion joints. There are plastic joints that are commonly used on pool deck surfaces, but a simple saw cut is just as effective and isn’t sensitive to UV rays over time. To be effective, the saw cuts must be made systematically in weak areas where the concrete is most likely to experience a stress crack. The number of joints necessary depends on a number of factors including the thickness of the slab, specific mix of concrete used, the type of reinforcement used, and the layout of the slab. For a saw cut to be effective, it needs to be at least 1/3 through the thickness of the slab. Based on my experience in Orlando, it is rare to come across a pool deck that was poured with a sufficient number of expansion joints. The plastic joints are most common and usually their placement isn’t ideal for preventing cracks from forming. The common result is a pool deck with lots of unsightly cracks. For the most part these cracks are harmless and are merely a cosmetic issue. There should only be concern if the slabs are shifting (one slab is lower than the other). How we treat the cracks depends on what we are planning to do to the surface. For a simple repaint on an acrylic pool deck, the best course of action is to seal the cracks before painting the surface. This makes the crack less noticeable, prevents erosion, and keeps insects out while allowing the concrete to naturally expand and contract with temperature fluctuations. When we are applying an overlay, the best course of action is to open the crack up and inject a high strength epoxy that works to prevent the crack from appearing in the new surface. Unfortunately, in some situations the natural forces of expansion and contraction are too much and the structural epoxy cannot hold. It is a common misconception that most concrete cracks due to settling. Regardless of how long the concrete has had to settle, there will be movement along a crack due to the natural expansion and contraction of the concrete that occurs with temperature change. It’s also a common misconception that cracks form because wire mesh or rebar wasn’t used. In many situations, the reinforcement actually causes the initial cracking. This happens because of the concrete trying to contract as it cures while being constrained. Contact the Decorative Concrete Experts in Orlando today for concrete forming/finishing and advice on how to handle cracks in your concrete surface at 407-342-8552. 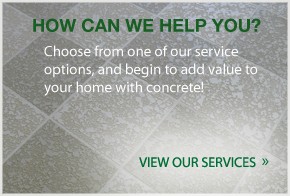 Click here for our page on Orlando concrete repair and replacement.